See the plan for my roadtrip through Laos and a map of my route here. My week in Hanoi was finally over. I was ready to get back on the road and head back to Saigon. It was a cold and gray morning. Traffic wasn’t too bad, but it still took an hour to get out of the city. I followed the new superhighway. This new road consists of a six land divided car only highway, and an additional two lanes for motorbikes and cars in each direction. Traffic was light. There’s a theory that says building roads encourages driving, so I wondered if the road would be packed with cars in a few years. The fields near the highway were full of workers. The sky was gray and it was cold, but I was wearing all my clothes so I wasn’t too uncomfortable. The ride wasn’t that interesting for much of the way. I eventually made it to limestone cliffs, but there was so much industrial detritus and suburban buildings spoiling the views. I came to a mountain and climbed it. As I went up it got colder. It was hard to see the views because of the fog. 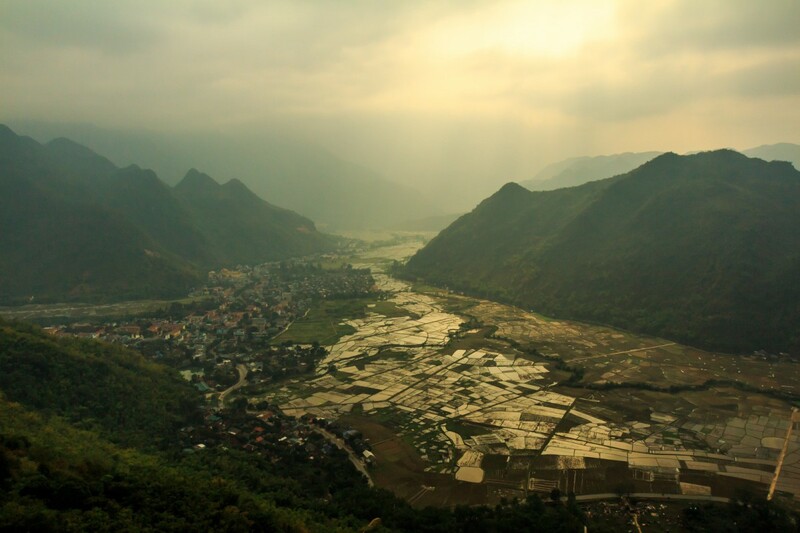 But I eventually crested the mountain and the glorious valley of Mai Chau came into view. I stopped in a coffee shop to enjoy the view and the lady called a homestay for me. There are many homestays so there is no need to make arrangements, but I just went with it. 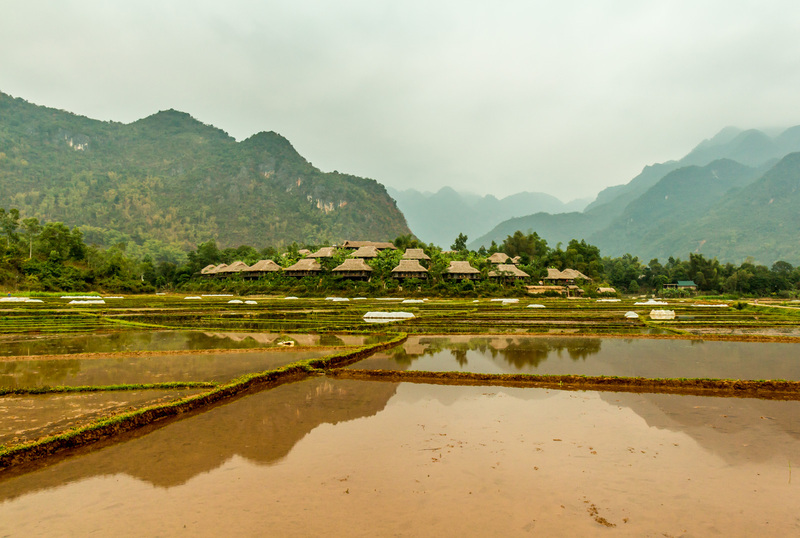 In the idyllic fields of Mai Chau. I rode down into the valley and the homestay owner’s wife met me in the rode. I followed her to the house. It’s right in the rice fields, so the location is nice. And the house is nice. These people aren’t poor. The homestays are all big, and paved with concrete underneath. Mine has a big metal awning covering the parking area and the front of the house. The owner looks like he eats well. The accomadation is just sleeping on a mat on the floor. I napped, then took a bike around. The fields are scenic, with mountains in the distance. But the fog obscured the views. 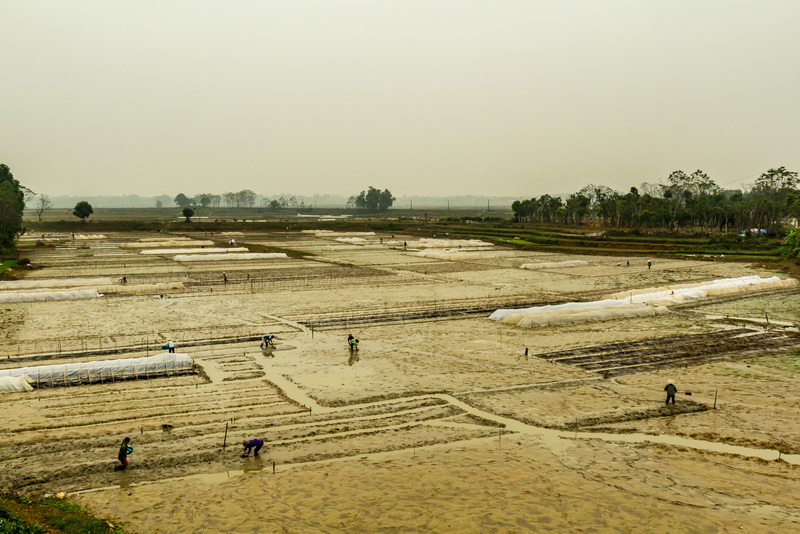 And since it’s winter, the fields are not planted with rice and there are many little plastic seedling shelters in the fields. There’s always work to be done in the fields. Back at the homestay dinner was incredible. So much food, and it was all good. There were even French fries, with a fantastic seasoning. I ate with the family. His wife and children barley touched the food, leaving most of it for me and the owner to devour. 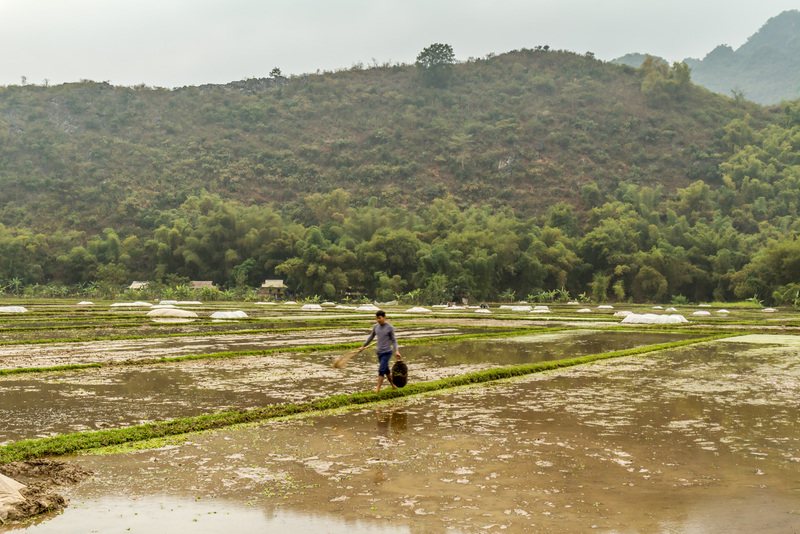 I’ve been sressing about visiting the Pu Long Nature Reserve practically since I left Saigon. I can’t find much information on how to find the homestays there on my own. And hiring the homestay owner to guide me is too expensive. I decided to ride in myself, and if I can find a homestay, great. If not I will sleep in the town of Cành Nàng. 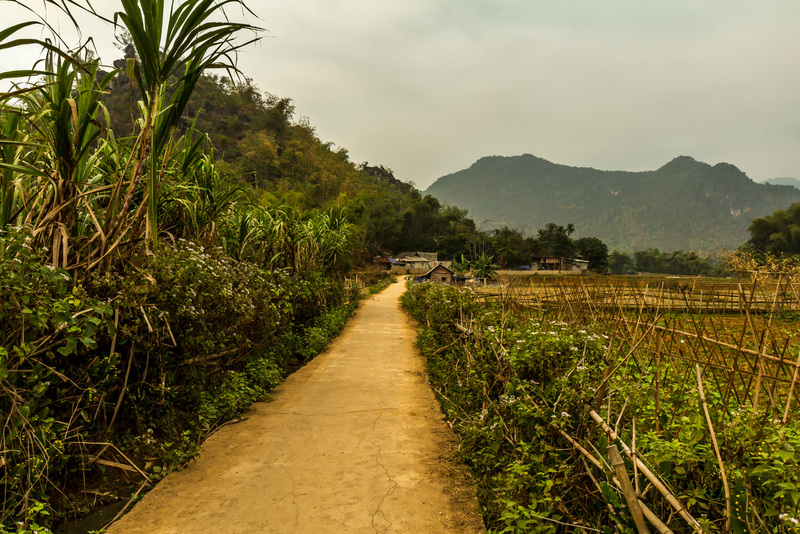 Exploring the back roads of Mai Chau. 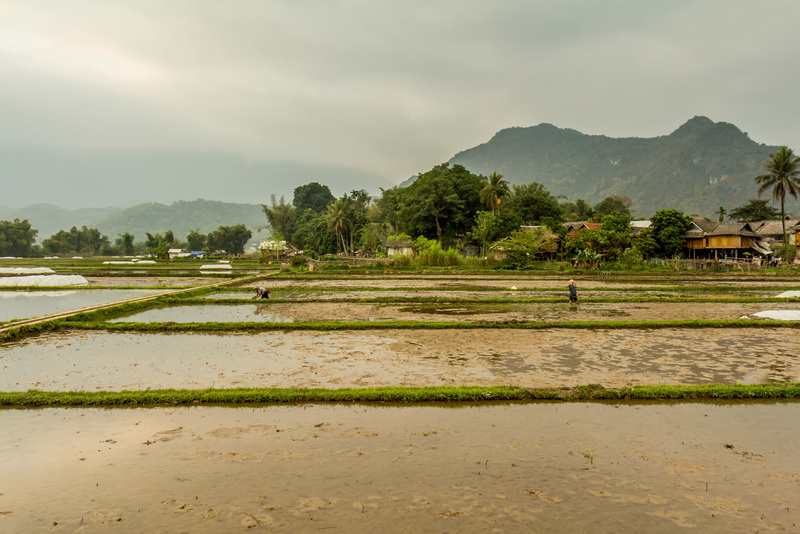 Deep in the rice fields was a mysterious traditional village… Actually, it’s just a resort.